The best thing about Aosom Elite II 3in1 Double Child Bike Trailer is that you can take more than one child with ease and you take them along way. A double stroller is a necessary thing for parents of twins and parents who have two or more little kids. It keeps the child safe and parents healthy. Aosom child bike trailers are stable and safe with plenty of safety features. No matter how you use it, your kids are riding in a carrier that is developed to offer the most comfortable and easy ride possible. When it comes to children, safety is the primary concern for every parent. Aosom Elite II 3in1 Double Child Bike Trailer comes with a comfortable cabin which protects your child from rain or dust. The suspension system, locking swivel front tire, hand lock brake system on rear wheel makes it the most comfortable and safe bike trailer for your children. With steel body frame and spacious cabin space Aosom Elite II 3in1 Double Child Bike Trailer can easily carry two kids as the total load capacity of this trailer is 88 lbs. So even after having kids, parents can live a healthy life by taking their children for jogging or just a walk round the block with them. Trailers are stable and affective and can be effortlessly attached to your bike. The hitch systems in Aosom Elite II 3in1 Double Child Bike Trailer is well designed, sturdy and reliable. It provides perfect comfort when attached, it does not put unnecessary, or too much stress on the joins. You don’t need a garage to store your bike trailer as it can be easily assembled and can be simply stored in a small area. 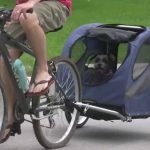 It allows you to transport your baby stroller bike via car to other a field locations and then go riding, so you are not restricted to your residential locality. Towing a trailer behind your bike can be challenging, from both a physical and technical standpoint, but double bike trailer for kids is designed in such a way with perfect wheel size that it does not put pressure on the rider. Tires on their own won’t stop the shock of curves or holes in the trail from the sudden jarring of impact. The center of gravity in a trailer is directly over the wheel base. Aosom Elite II 3in1 Double Child Bike Trailer has a built in suspension system which provides smooth and comfortable ride for your child. 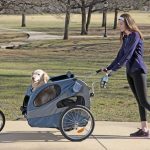 You can lock the front wheel if you are interested in jogging and it can swivel for strolling, furthermore, it can be completely removed while using it as a child bike trailer. 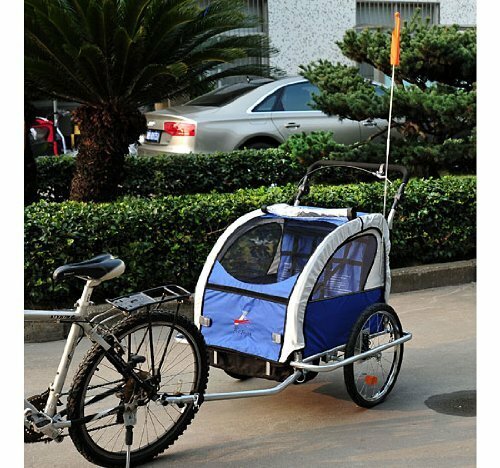 This is the reason that the name of this product is 3in1 Double Child Bike Trailer. The load and the joy of parental responsibility can actually get in the way of staying in shape. But by using a bike trailer regularly keeps you fit and healthy. Quality time with family is really important. Going out with your kids on bike is a great way to spend some quality time with your children. It gets the kids out in the fresh air, they can feel the cool breeze, smell the flowers, observes the cows, butterflies and other natural essence which help your child’s overall growth. Child Bike trailers make your bicycle’s overall length longer, heavier, and harder to maneuver. With all that extra weight, you might not get the desired speed resulting in increased travel time. Aosom Elite II 3in1 Double Child Bike Trailer can be converted into a child bike trailer, stroller or jogger making it a versatile option for all of your wheeled kid transportation requirements. The cabin protects the child from all weather conditions. Overall it is a perfect product in every aspect may it safety, durability, versatility etc.